Flavours of Bellota Iberian Products: The Smooth flavour In general, a cooked dish or food attracts us more by smell and sight than by taste. Therefore, we will not appreciate its taste if we have not previously smelled it and analysed it with our eyes. If we are referring to bellota Iberian ham or any cured meats of the same kind, the visual and olfactory combination so full of nuances and aromas, such as colour, shine and texture, makes our palate start to salivate and savour this delicacy long before we taste it. 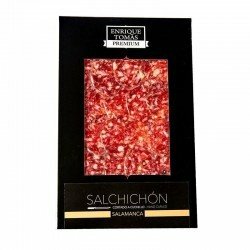 By the smell and of course the taste, we will know without a doubt that it is Iberian ham, on the other hand it will not be so easy to define that sensation. However, as experts and lovers of ham in Enrique Tomás we know well the flavours of ham that is produced in the Iberian Peninsula and we are going to explain everything so that you know what you buy and above all what is best adapted to your palate to enjoy eating our cured Iberian ham, especially our culinary jewel, the Iberian ham. And for it we will begin with the most amiable flavour, the Smooth flavour. Let's go! The Smooth Ham comes from the ham shoulders or hams of Iberian breed. It comes from Iberian pigs raised entirely in our Iberian Peninsula. It is the wild card ham to guess if we want to make a gift and we only know that the receiver likes the ham. Surely with this flavour you will not make a mistake. If there are different tastes and ages in the family, it is also perfect for the snacks of the youngest, the tapas of the elderly, the ideal entrance for unexpected guests. It is so juicy that it could even be something sweet even though, as cured as it is, salt is present, but it does not invade. In short, it's delicious! If we compare it with a cloth, we could say that it is velvet, if we think of a favourite dish think of the one you always like to eat, no matter the time of day or how simple it is but the pleasure it gives you in your mouth. Got it? Well, that's exactly what we mean because Iberian ham is not just food, it's pure pleasure, your pleasure. What products qualified with Smooth Flavour make up our range of possibilities? In Enrique Tomás we distinguish the Smooth Flavour with the yellow label. The soft taste in the ham and the loin (lomo) is always bellota of Iberian breed, in whole pieces, half pieces or sliced. 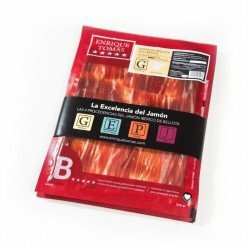 Also, our Packs “Ready-to-eat” of sliced and sachets of 80 grams of the best ham or ham shoulder or loin share prominence with the rest of the pieces. And, there's even more! 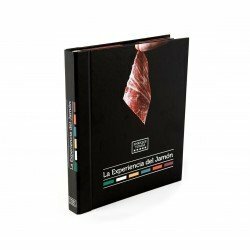 the star pack, the Box of Flavours, where you'll have, in addition to the jamón and the lomo, the chorizo and the sausage from the same geographical area that identifies them. As you can see, there's nothing missing! Choose the product you want and enjoy the smooth and delicious flavour. You'll love it, they'll love it!